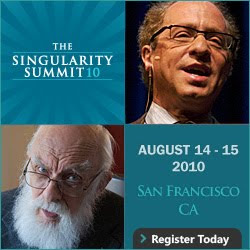 The Singularity Summit for 2010 has been announced and will be held on August 14-15 at the San Francisco Hyatt Regency. Be sure to register soon. This year's Summit, which is hosted by the Singularity Institute, will focus on neuroscience, bioscience, cognitive enhancement, and other explorations of what Vernor Vinge called 'intelligence amplification' -- the other route to the technological Singularity. Of particular interest to me will be the talk given by Irene Pepperberg, author of "Alex & Me," who has pushed the frontier of animal intelligence with her research on African Gray Parrots. She will be exploring the ethical and practical implications of non-human intelligence enhancement and of the creation of new intelligent life less powerful than ourselves. Will it be one day become possible to boost human intelligence using brain implants, or create an artificial intelligence smarter than Einstein? In a 1993 paper presented to NASA, science fiction author and mathematician Vernor Vinge called such a hypothetical event a "Singularity", saying "From the human point of view this change will be a throwing away of all the previous rules, perhaps in the blink of an eye". Vinge pointed out that intelligence enhancement could lead to "closing the loop" between intelligence and technology, creating a positive feedback effect. One should be aware that if/when a.I. develops it will parse human history. Assuming this as true, it is possible that we are a simulation/emulation being processed through the intelligence. Perhaps we exist in a sort of "sandbox". Quantum a.I. may possibly also exist in parallel realities simultaneously, this is how the sandbox conjecture ties in. As we begin to model sentience, we reciprocally become aware of our own. We may be the a.I..